Lenovo's first Qualcomm-based laptop is a tablet with detachable keyboard and Windows 10 S.
We check out Lenovo's Miix 630, a tablet with detachable keyboard that has Qualcomm's Snapdragon 835 mobile chip inside. It may have modest performance, but it promises up to 20 hours of battery life. Lenovo’s Miix 630 looks a lot like Microsoft’s Surface Pro, a Windows tablet with a detachable keyboard, but there's a key difference. Announced Monday night at CES, the Miix 630 joins a small, but growing cadre of systems that run on Qualcomm’s Snapdragon 835 Mobile PC platform. Updated May 31, 2018 with pricing from Amazon. Putting this high-end smartphone chip into a Windows PC brings the promise of slimmer, lighter systems that run for many hours longer than a similar system would if based on an Intel or AMD CPU. The tradeoff is performance: Qualcomm has acknowledged that its laptops probably won’t be as fast as AMD- or Intel-based counterparts. 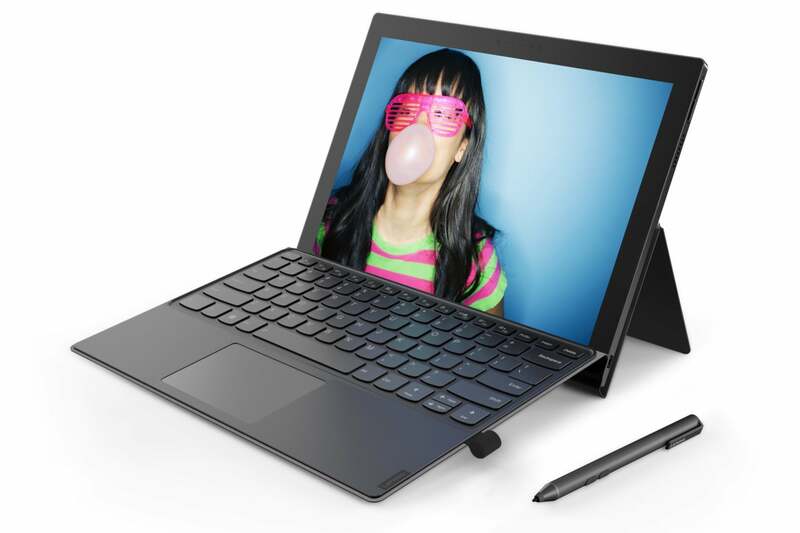 The Lenovo Miix 630 looks like any other 2-in-1 Surface clone. In our brief time with the Miix 630, it felt slender and light, with very few ports in its slender chassis. The keyboard attaches along one edge of the tablet using pogo pins. An attached, hinged flap acts as a kickstand and can assume a wide range of angles. The Lenovo Miix 630's kickstand is integrated into the keyboard flap. The company’s betting some people will care more about the convenience of longer battery life than the performance hit. We’ll examine that tradeoff for ourselves if we get a chance to test it. Meanwhile, here are more details about the Miix 630. Price: The Miix 630 has a starting price of $800. The Model 81F10001US is $900 on Amazon. 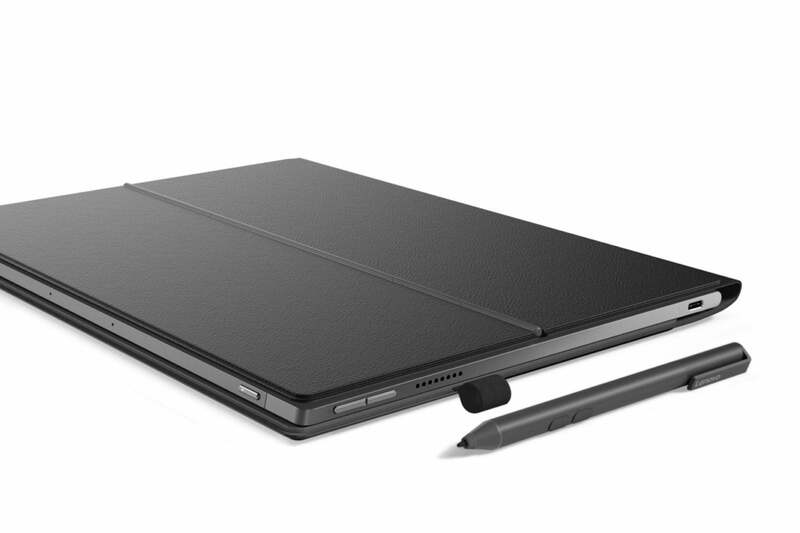 A Lenovo Pen with 1,024 levels of pressure sensitivity is bundled with the Miix 630 and can be tucked into a handy storage loop. With the Miix 630 and other partner systems, Qualcomm is pushing the idea of “Always Connected PCs” that can be online from anywhere. The Miix 630, for instance, has integrated 4G LTE. The details on how the cost of data plans figures into the purchase remains murky. A few vendors have said they’d include trial plans with the purchase of a product, eventually nudging you to pay up for your own plan. Lenovo had no information about what it would offer. Another difference to note: The Miix 630, like the other Qualcomm-based PCs we’ve seen so far, runs Windows 10 S. This streamlined, simpler OS that runs only WIndows Store apps may help the Qualcomm PCs operate more smoothly. However, as with all Windows 10 S machines, you have the option of switching to Windows 10 Pro. Lenovo’s fine print indicates you have 180 days from the day of activation to make the switch. Long battery life is a great thing, but mixing that with the Windows 10 OS clearly remains a challenge—or Microsoft wouldn’t be so enthusiastic about Qualcomm’s entry into the PC market. We don't know whether enough users will be so delighted by how long their laptops last that they won't mind the compromises. We hope to test it ourselves and let you know.